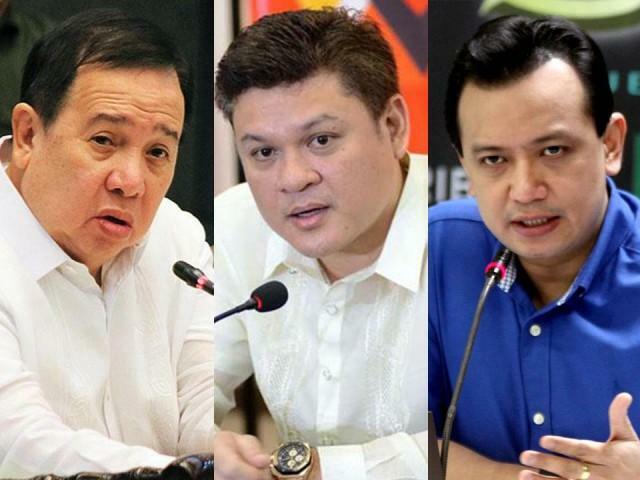 MANILA -- Senator Richard Gordon on Tuesday urged Senator Antonio Trillanes IV to produce evidence showing that presidential son and Davao City Vice Mayor Paolo Duterte and Manases Carpio -- husband of Mayor Sara Duterte-Carpio -- are involved in corruption at the Bureau of Customs (BOC). “Senator Trillanes said that Paolo (Duterte) is included but he has not produced any evidence. He has to produce the evidence. I cannot just call anyone here,” Gordon told reporters in an interview when asked if his committee would subpoena the Vice Mayor for questioning. Gordon, chair of the Senate Blue Ribbon Committee, in charge of investigating, in aid of legislation, the PHP6.4 billion worth of shabu shipment from China that slipped through the BOC. Trillanes made this allegation after former Customs Intelligence and Investigation Service (CIIS) chief Neil Estrella mentioned in a Senate panel hearing that he once saw Carpio at the BOC office. During the 5th Senate panel hearing into the illegal shipment, Trillanes questioned Estrella and other BOC officials asking them if their office was ever visited by either Paolo Duterte or Carpio when they clearly had “no business” there. Estrella said he has not seen Paolo Duterte at the BOC office but has admitted seeing Carpio there to visit former BOC Commissioner Nicanor Faeldon. The former CIIS chief, however, said that he was not privy to the details as to why Carpio was there. Trillanes, for his part, said he has at least three informants who could prove that both Paolo Duterte and Carpio have visited the BOC office. It may be recalled that Trillanes earlier claimed that both Paolo Duterte and Carpio are part of a so-called “Davao Group” that allegedly facilitated the release of the illegal shipment. Trillanes also alleged that a friend of Paolo Duterte, Davao City Councilor Nilo “Small” Abellera Jr., is also a member of the said group. Abellera, however, denied any knowledge and participation in the illegal shipment. Trillanes, meanwhile, requested former Customs Deputy Commissioner Gerardo Gambala to provide the Senate panel with copies of BOC’s CCTV footage in the next hearing to check the people who came in and out of their office. Gordon, in a separate interview, said he will leave it up to Trillanes if he would want to call them to the Senate probe.